Absolute centering in CSS is a well-acquainted task to front-end developers. By absolute, we mean to center a certain element both horizontally and vertically. This article covers some nice ways to achieve that with some implementation examples. Not in every case you may find the inline-block technique robust or even working. In some cases, you might also need to change the display to table of the parent (wrapper) to make the children appear aligned to the center properly. And honestly, nobody wants to use inline-blocks and tables anymore, when you have flexbox! Of course, for fallbacks, you may consider inline-block based middling wherever needed, but I have one more technique that seems much more handy than them. Let’s jump into the techniques without any delay. No explanation is needed, when it comes to aligning things with CSS flexbox properties. With the CSS flexbox module, you have a great control over aligning elements and not just the centering, but you can do a lot more things with properties like justify-content, align-items, align-content, and align-self. By default, the flex-direction is set to row, and supplying the center value for justify-content will make the content inside the flexbox aligned centered horizontally. For vertical-centering, the center value to align-items will align the flexbox content centered vertically. And as you might have guessed already, using the value center for both justify-content and align-items will make the flexbox content aligned at absolute center of the box. This technique is not required anymore, since you have flexbox working just perfectly for you. But! You always need a fallback to the modern CSS properties if your job required to make things compatible to older browsers as well! Giving a top and/or left offset (50% of the total space available) to the absolutely positioned element. It’s the element which we want to appear aligned vertically/horizontally/absolutely centered. The element will now be starting from 50% horizontal and/or vertical coordinate(s) onwards of the total available space, which is of course, not the horizontal/vertical/absolute center of the parent division. 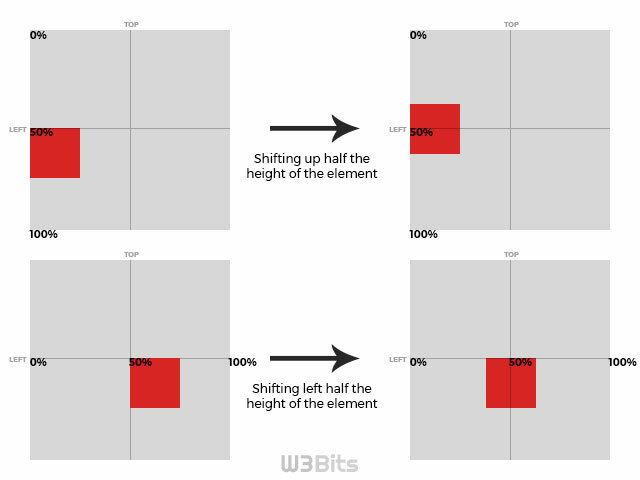 In order to make it look centered, we can make some shift to the element to little on top and/or left side; that shift should be equal to half the width and/or height of the element. What comes to your mind to make these shifting with CSS? I think CSS transform property is all we need here. A small pitfall of this technique is, you might need to provide a height at times when you need the parent element to be obvious enough. Horizontal centering can be obtained by placing the object to 50% left inside the box, and then shifting it to left half of it’s total width. Vertical centering is achieved by giving a 50% to the top inside the box, and then shifting it up half of it’s total height. And obviously, placing at 50% from top and left inside the box, the object is required to be shifted left half of it’s total width and up half ot it’s total height. That’s it. You may however experiment using relatively positioned child elements too in the last technique I mentioned, but using absolute child inside a relatively positioned parent gives you more control as it doesn’t messes up with the flow anymore.